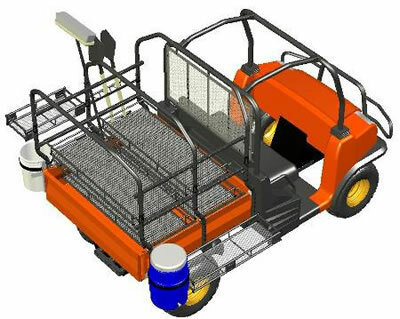 Give your grounds crew the all-day productivity of a mobile tool rack with this suggested configuration. Carry a backpack blower, string trimmer, cooler and 3 long handled tools to handle most any task along the route. 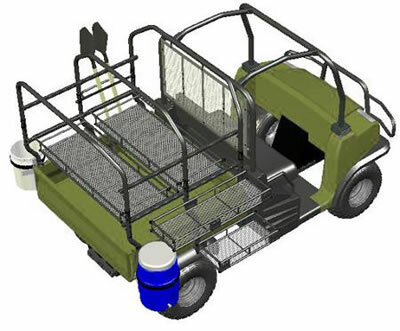 Three baskets provide open carrying solutions for a wide range of cargo all while still having access to the full cargo box floor. Add and remove attachments according to your particular needs. Hold items on either side of the main support risers. Even upgrade to the Full RAC Structure by replacing the top structure when your needs grow. Upgrade to the Full RAC Structure and maximize your carrying capacity for larger grounds maintenance tasks. 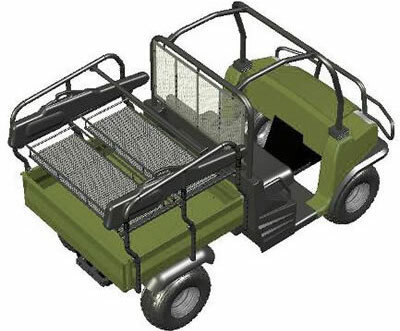 Carry an additional string trimmer or pole saw, increase organization with four baskets to provide open carrying solutions for a wide range of cargo all the while still having access to an uncluttered cargo box. Add or remove attachments, mount inside or outside the RAC according to your needs. The system is fully ready to grow with you and can be reconfigured as your needs change. More attachments will be available in the future to continue expanding our solutions. Your crew will be able to handle a variety of tasks without having to go back to the shop to retrieve additional tools or more materials with this setup. It provides the carrying capacity and organization required to get the job done. 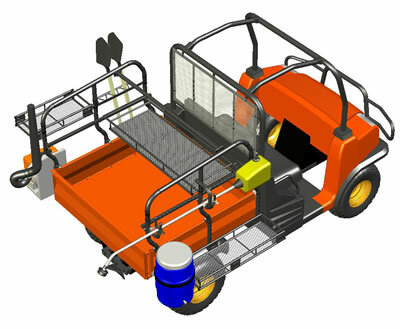 This configuration includes a Half RAC Structure and 4 attachments providing users with versatile carrying solutions for a wide range of items, such as tools, supplies, equipment, etc. Add, remove, and reconfigure attachments according to your particular needs. This RAC Structure can be easily upgraded to the full RAC by simply replacing the upper portion of the RAC Structure. 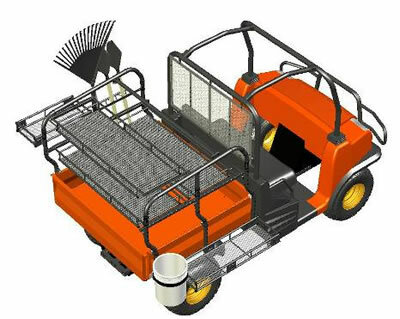 The Full RAC Structure is ideal for managing the grounds maintenance of large institutions. 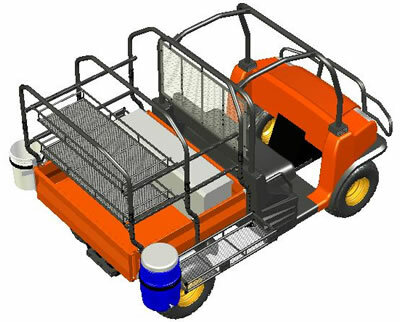 If your crew needs to handle a wider variety of tasks and transport a greater variety of tools and cargo, they’ll save time and effort with this configuration while further reducing the frequency of trips back to the shop. This configuration includes a full RAC structure, 6 attachments and 2 extender baskets. This configuration provides a stackable separation of items that doubles the footprint of the cargo box. Side baskets provide open storage for “grab and go” tasks. The cooler/bucket crusier carries coolers and buckets, and will hold power tools securely in the cargo locker. Add, remove, and reconfigure attachments according to your particular needs. Get more done faster and more efficiently around your nursery with this suggested configuration. Transport trays of small, medium and large plants, bags of fertilizer, soil, along with your shovels, rakes, brooms, and other small tools. Carry additional plants and supplies along the outsides with the side baskets. Carry up to 2.5x more plants with each run into the nursery for your clients. Load stacks of different sized plants and trays in the extender baskets and along the sides with side baskets. You’ll notice a tremendous increase in efficiency with this setup, serving more customers in less time. This suggested configuration is ideal for pre-season habitat and food plot maintenance. More gear and supply carrying capacity = less trips back and forth to the food plot! Carry all your hunting gear with you and all your buddies, and have room to carry your game. This structure was tested for over 100 hours on rugged trails to handle the real world demands you expect from your gear. The RAC Structure is compatible with the leading gun boot manufacturer. Gun boots are not included or available through Kubota.